Big Tentacles: Ohio State, Bobby Knight, Joe Paterno, and more. You can now roll Toomer's Corner online. The tradition of rolling Toomer's corner has been put on hold while attempts to save the majestic oak trees from poisoning are ongoing. So leave it to the Internet to step in and provide Auburn fans a place to partake in one of their cherished rites of fall whenever they want. 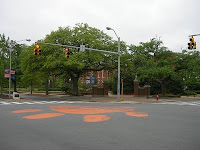 A site called toomersoaks.com gives Tiger fans and anybody else a place to virtually cover one of the famous trees, while providing a link to the Toomer's Trees and Traditions Fund. 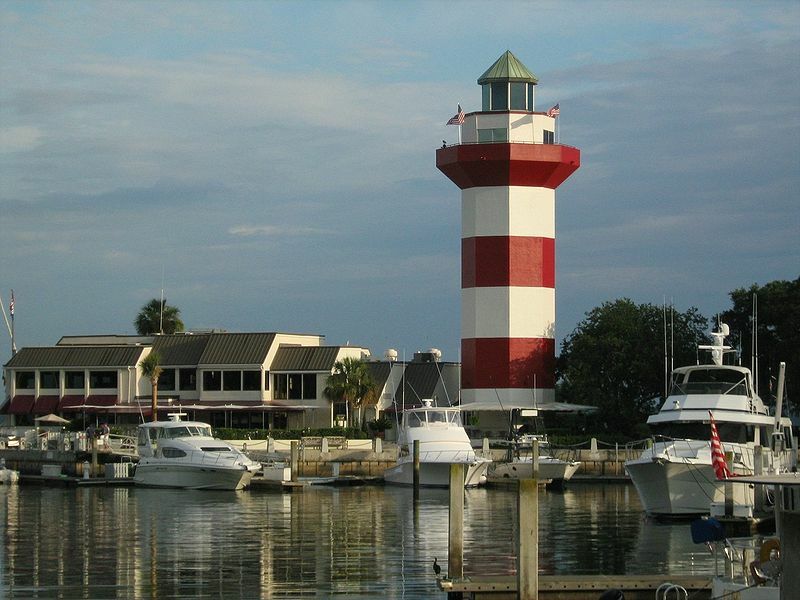 Covering Dixie Like Mildew: Ryan Mallett, Greg McElroy, Julio Jones, and more. Running Out of Days? Bruce Pearl may be "running out of answers" where it comes to Tennessee's lackluster play. And thanks to the NCAA's investigation of the Tennessee athletic program, his tenure as the Vol's head men's basketball coach be running out of time. Signs of hope on Toomers Corner? There may be signs of hope for the trees on Toomer's Corner a week and a half after the announcement that the trees had been poisoned with a heavy amount of herbicide. "The soil below the surface at Toomer's Corner is showing lower levels of a deadly herbicide than originally feared, but experts say it's too early to know if the trees will survive at the Auburn University landmark." The trees are still in danger, but any sign that the trees could possibly be saved is a good one. Ricky Stanzi, International Man of Mystery. The biggest mystery in the 2011 NFL Draft would seem to involve Iowa quarterback Ricky Stanzi. Part of that is because of the differing opinions of where Stanzi (aka America's Quarterback) should rank among this year's batch of QB's. Part of the problem might be that Stanzi has been better known for his fervent patriotism than for his resume as starting QB at Iowa, which includes winning the 2010 Orange Bowl. Iowa somewhat underwhelming 2010 season hasn't helped clear away any of the questions many Draft gurus and football scouts have about how good of a pro QB Stanzi could be. It's resulted in a considerable variance when it comes to the projections of what round he'll go in the Draft. Mel Kiper Jr. of ESPN, seems to be higher on Stanzi's draft stock than than other pundits. He feels that Stanzi deserves to go in the second round of the Draft, and points to his 59.2 third-down completion rate and his 3-0 bowl game record with Iowa . Other experts are not as sold on Stanzi as Kiper is, resulting on a wide range on opinion on where he ranks among other QBs in the Draft. "Pro Football Weekly rates him the third best quarterback in the draft – behind Blaine Gabbert of Missouri and Jake Locker of Washington and ahead of Heisman Trophy winner Cam Newton of Auburn and Ryan Mallett of Arkansas. 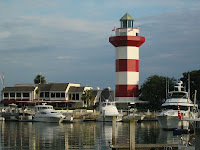 Lindy's Pro Football Draft report pegs Stanzi as the ninth-best quarterback and projects him as a fourth-round pick." 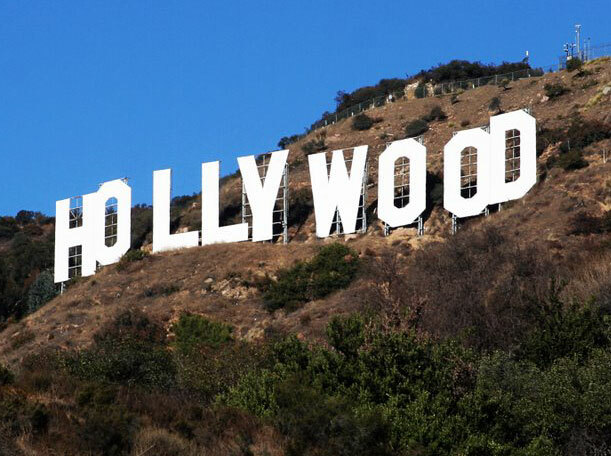 Stanzi's draft stock may be higher or lower when the NFL Combine ends later next week. Though he might not become a first round pick, Stanzi may end up as being one of the bigger bargains in the Draft. If his pro career is as good or better than his college career has been, that is. Tim Tebow recently hung out with some of the best ping pong players in the world in Las Vegas. Naturally, they played ping pong. And you wonder why Denver Broncos head coach John Fox decided to go with Kyle Orton as his starting quarterback next season. Penn State uniforms to get even more boring. There is a school of thought that admires Penn State for the spartan nature of its team uniform. The white helmet with the simple blue stripe, blue jersey and white pants recall the Mad Men days of smash-mouth football without the vulgarities things such as teams with a gazillion alternative unis or players with intricately choreographed touchdown celebrations. Others see it as representative of a team stuck in the past wearing modestly nondescript uniforms. If you're in the latter category, then get ready for the Nittany Lions unis to get even more boring. 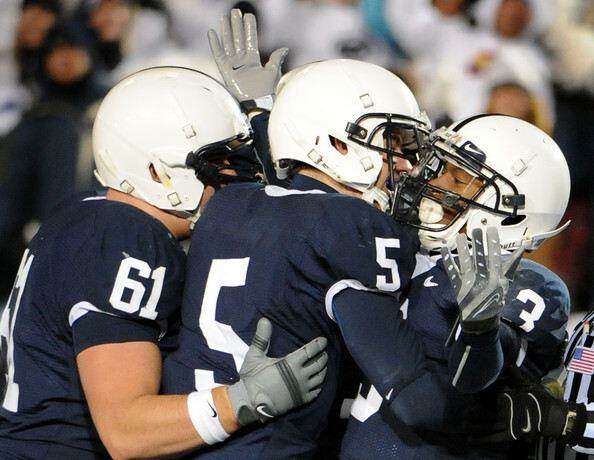 Guido D'Elia, the Penn State director of football communications and branding, told a class at the university that the team's uniforms would be getting a slight makeover for the 2011 season. "Speaking to a class at Penn State, D'Elia indicated the home-uniform white trim around the neck and on the sleeves would be eliminated. Also, the road-uniform blue trim would be eliminated. (If true, Penn State's road uniform would be whiter than the Boston Celtics of the 1980s.)" First off, can Penn State's uniform get even more generic? Second, is there ironic title than "Penn State director of football communications and branding?" Branding is such a 21st century term that having it used in the same context as the Penn State Nittany Lions borders on the edge between being a complete contradiction in terms, and an absolute paradox of logic. There is merit in doing things like they did in the old days, but this is taking things to extreme. The all blue jersey without any kind of trim is two shakes of a rat's tail away from being your average pee wee football league jersey. Old-school sensibilities are admirable, but at the same time, there is at least on some level do something to be distinguishable. 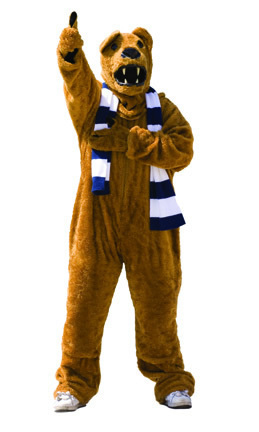 Penn State is bordering on being totally generic when it comes to its team uniform. It might wrangle a few fans if say, there was a logo on the team helmet. But at least it would give the team a comfortable level of identification. It wouldn't hurt when it came to licensing, either. Maybe when Joe Paterno finally retires, Penn State will decide truly enter the 21st century realm of brand identification. Until then, its old school mentality is beginning to border on the ridiculous. The Buffalo Bills question Cam Newton's QB experience. There is a good chance that former Auburn quarterback Cam Newton will be tapped at the overall number one pick in the 2011 NFL Draft by the Carolina Panthers. If they choose to go in another direction (like Newton's teammate Nick Fairley), the Heisman Trophy winner might run into some turbulence from other teams. The Buffalo Bills, who pick third in the Draft for example, have big questions regarding the controversial QB's level of experience. The skepticism is exemplified in the Bill's goodwill ambassador, Hall of Fame quarterback Jim Kelly, who led the team to four Super Bowl appearances. Kelly is concerned with the fact that Newton has only one year of experience as a starting quarterback. Kelly isn't directly involved when it comes to selecting players in the draft, but his questions on Newton's experience are shared with the Bills head coach, Chan Gailey. Gailey raised a red flag in a press conference when it came to Newton's experience in a pro-style offense. "A one-year guy that had been in the pro-type offense, to me he's going to understand and be further along than the guy who was one-year in a non-traditional style pro offense." The Bills are in need of a solid quarterback, but the 2011 NFL Draft has several QB's with more experience and greater potential for NFL success than Newton. Other teams may share the same concerns for Newton as well. Roll Tweet! Mark Ingram is on Twitter. 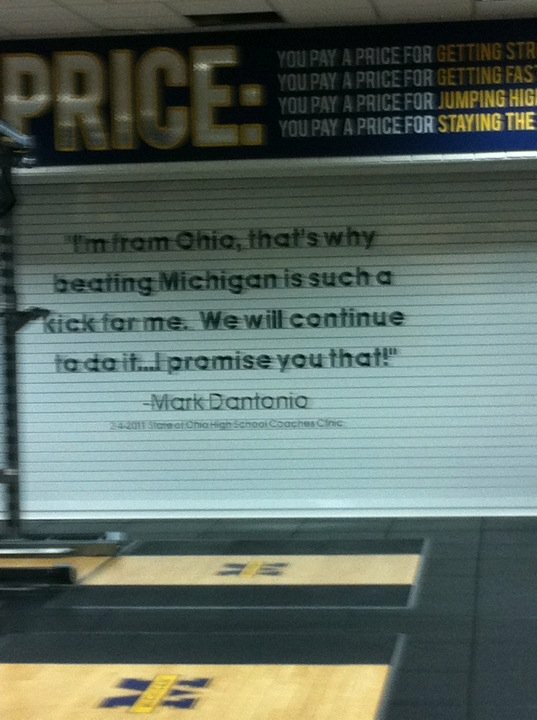 Brady Hoke redecorates the Michigan weight room. Brady Hoke has been on the job at Michigan for less than two months. That hasn't stopped him from making a few decorative changes in the weight room. Hoke has added clocks counting down the days until the 2011 games against Michigan State and Ohio State (which Hoke calls "Ohio," doing the nerdy coach-won't-call-the-rival-by-its-real-name thing). He's also added a quote from Spartan head football coach Mark Dantonio allegedly made at a coaching clinic. Whether or not that is an actual Dantonio quote is up in the air. But the quote and the countdown clocks show the level of hokeyness the Wolverines' new coach has brought to his new job. (Or is that Hokeness?) Countdown clocks are so "two-thousand-and-late" they're even more stale than that Black Eyed Peas already is. Covering Dixie Like Mildew: Greg McElroy, Ryan Mallett, Chris Relf, and more. Big Tentacles: Tyler Sash, Ricky Stanzi, Tom Izzo, and more. Life just isn't getting any better for Harvey Updyke. The bad news for accused Toomer's Corner poisoner Harvey Updyke: He's reportedly living in his car after the owner of the house he was renting in Alabama kicked him out asked him to leave, apparently fearing for his own safety. Updyke apparently can't even afford a van to live down by the river in. The even worse news: Updyke is on his fourth attorney, as two previous court appointed attorneys cited connections to Auburn as conflicts of interests with representing the accused tree poisoner, and another asked to be removed because he just couldn't get along with him. The worst news: Clay Travis is apparently the only attorney in America who really wants to represent Updyke. 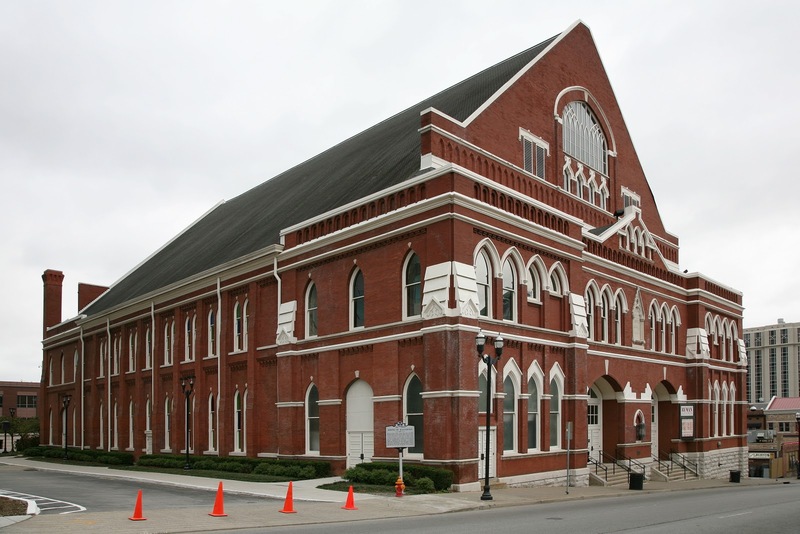 Is Judment Day coming for Tennessee? ESPN reports that Tennessee has received the long awaited notice of allegations from the NCAA over incidents involving the football men's basketball, and baseball programs. The notice is expected to be released to the public later on Wednesday. "The allegations involving the football team go back to Lane Kiffin's turbulent 14 months as the Vols' head coach during the 2009 season, and some of the most serious charges revolve around a trip Tennessee recruiting hostesses took to Duncan, S.C., to see a pair of high school prospects the Vols were recruiting. One of those prospects is current Tennessee defensive end Corey Miller." As for the men's basketball program, it centers around improper recruiting practices directly involving head men's basketball coach Bruce Pearl. The school will go reportedly before the NCAA committee on infractions on June 10-11. The men's basketball program will probably get the blunt of the penalties, the football program is not expected to be hit with anything like what the NCAA hit USC with, which is now coached by Kiffin. There is a pretty good chance that Tennessee athletic director Mike Hamilton's job might not survive any sanctions. Covering Dixie Like Mildew: Aaron Murray, Janzen Jackson, and a steer named after Trey Burton. Unquiet on the Western Front: Jimmer Fredette, Stanford's Shane Skov, Chris Petersen, and more. "Tiny" award is a big achievement. Former Cal wide reciever Jeremy Ross was honored with the Tiny Bates Award, which is given each year to the most outstanding Cal senior from the Sacramento Valley area. 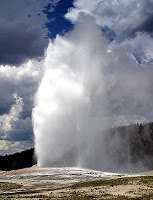 (California Golden Blogs). 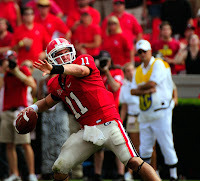 Aaron Murray sprains his ankle. The bad news for Georgia and Aaron Murray is that the starting quarterback sprained his ankle in a pick-up soccer game during the weekend. He's walking around the UGA campus on crutches, but should be healed up by spring practice. 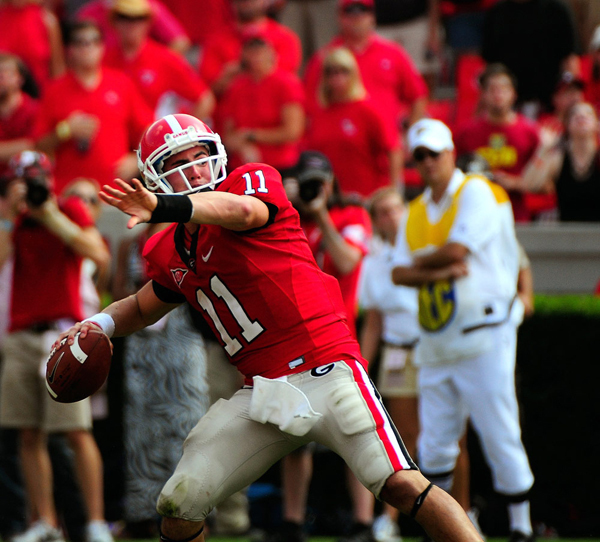 The good news for Aaron Murray? Twitter "personality" Summer of Mallet has tweeted that Murray can borrow his scooter. Is Appalachian State Conference USA bound? Southern Pigskin is reporting on a rumor that Appalachian State is ready to move on up to the FBS, and is looking to join Conference USA. 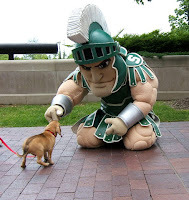 It would be a huge move for the school which got national attention for its upset victory over Michigan in 2007. The main roadblock in the move is that C-USA would have to apparently drop a team to make room for the Mountaineers. But is UCF or Memphis make the move to the Big East (which will probably happen sooner or later), someone's going to have to step up and fill the void. Big Tentacles: Nebraska vs. Northwestern, Jordan Taylor, and...Bon Jovi? Your moment of Jimmer Fredette manlove of the day with yet another parody song. America's New Mancrush, Jimmer Fredette, scored 23 points in BYU's victory over TCU today. What better excuse to post another Jimmer Fredette song parody. Your Freudian Nightmare of the Night, courtesy of the University of Michigan hockey team. The University of Michigan hockey team performed a skit spoofing The Price is Right at UM's annual Mock Rock charity variety show, which benifits the school's C.S. Mott Children's Hospital. Warning: this skit features a) A contestant in too short shorts with too high socks, b) Male hockey players in swimsuits (both male and female kinds) playing Barker's Beauties, and c) Not-so gentle ribbing of former Wolverine quarterback Tate Forcier. 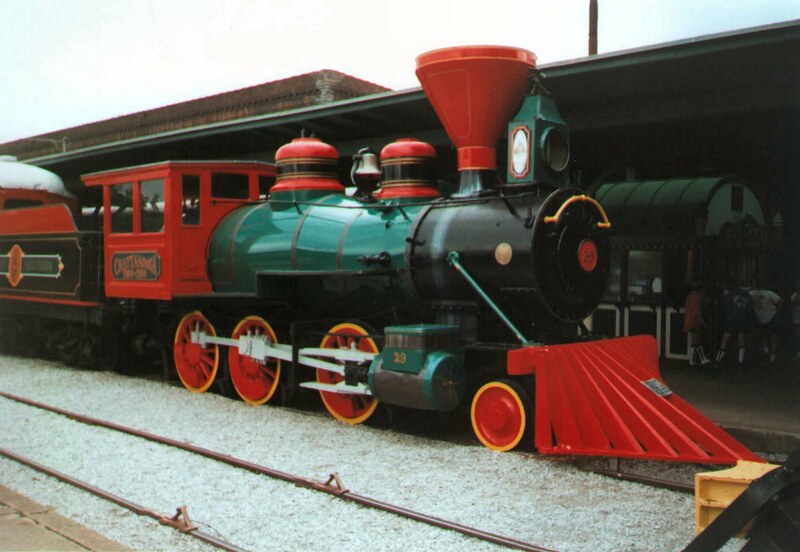 Let's all hope that the "Barker's Beauties" didn't suffer any sexual harassment from "Bob" like the real ones (allegedly) did. Your moment of Jimmer Fredette manlove of the day, but this one's for the ladies. All the women of America love Jimmer Fredette. Here's the proof. "I didn't care about sports/Until I saw you in your shorts." Inspired writing there. 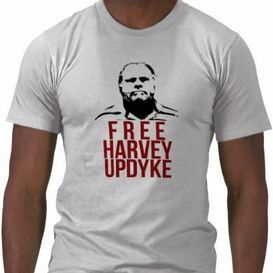 Shirts Without Random Triangles: Someone made a Harvey Updyke t-shirt. Call this the least shocking event so far in the Toomer's Corner poisoning case. Some goober is trying to make a buck off it. It didn't take long before this t-shirt with Harvey Updyke's notorious grill on it showed up online. Just remember not to wear it anywhere around Auburn anytime soon. Like for a couple of decades or so. 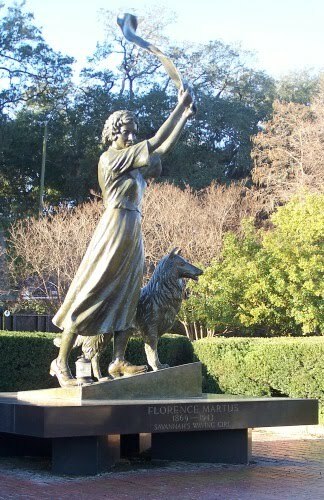 Covering Dixie Like Mildew: The Toomer's Corner case, UGA, LSU, and more. Arrest made in Toomer's Corner poisoning case. An arrest has been made in the poisoning of the oak trees of Toomer's Corner. "Auburn police said Harvey Almorn Updyke, 62, of Dadeville, was arrested at 1:26 a.m. Thursday on a warrant charging him with criminal mischief. Investigators said his arrest stems from an investigation involving the application of herbicide to the oak trees located at Toomer's Corner in the downtown area." 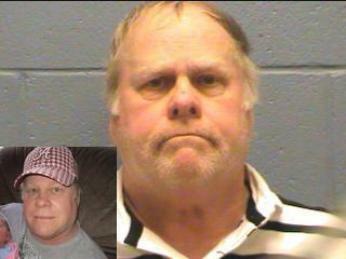 Updyke could face one to ten years in prison for the criminal mischief charge, which is a Class A felony in Alabama. Your moment of Jimmer Fredette manlove of the day. The Jimmer Fredette manlove parade continues. Here's yet another video dedicated to the, uh, "Mormon Chris Paul." There's really nothing much to add to that one. Alabama puts Walk of Champions under video surveilance. Alabama has taken steps to halt the rampant acts of vandalism on the Walk of Champions that might have resulted in the poisoning of the oaks on Toomer's Corner at Auburn. The school has placed the area under video surveillance. Or at least its reminding students and visitors its under surveillance.So just in case somebody decides to let this asinine cycle of vandalism return to the 'Bama campus just remember - Big Al is watching you. Here's the audio of Al, the caller on the Paul Finebaum show from last January who said he poisoned the oak trees at Toomer's Corner. This clown not only makes Alabama look bad, he makes the whole South look bad. Not to mention college football fans. On a different note, check out @toomersoaks out on Twitter. It one of the more funny, sad, and yet moving on some level at the same time accounts on Twitter right now. Which for a fake Twitter account claiming to be a tree is saying a lot. Toomer's Corner trees on Auburn campus poisoned. There are times that college rivalries can get out of hand. This is the case where an Alabama fan called in to Paul Finebaum's radio program on January 27th, claiming to have poisoned the oak trees at Toomer's Corner on the Auburn University campus. Auburn officials announced today that the trees had been poisoned, and probably won't survive. Police are investigating the situation. 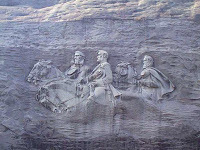 There's no word if there is a connection to the recent acts of vandalism to Bear Bryant's statue or the writing of the 2010 Iron Bowl score using rye grass allegedly committed by Auburn supporters. Either way, this is taking things way too far. Just when you thought that had finally recovered from that crummy Jimmer Fredette "Wanted Dead or Alive" parody tribute song along comes the Jimmer Fredette rap tribute. And naturally, it's a takeoff of "Teach Me How To Dougie." Please kill me now. At least it isn't as Freudian nightmare-inducing as that Wisconsin "Teach Me How To Bucky" video. The last one of those I had involved Bucky Badger dressed up as a Drill Sergeant who had me in the front leaning rest position and...I don't want to talk about it. It's too painful to think about. Anyway, it's this isn't the first rap song about America's New Mancrush. Fredette's brother, TJ Fredette recorded a rap song for him that he listened to before last year's first round victory against Florida in the 2010 NCAA Tournament. Not bad. TJ's probably going to be singing that in front of an NBA crowd before next fall (barring a lockout). Covering Dixie Like Mildew: Cam Newton, Jadeveon Clowney, bracketology, and more. 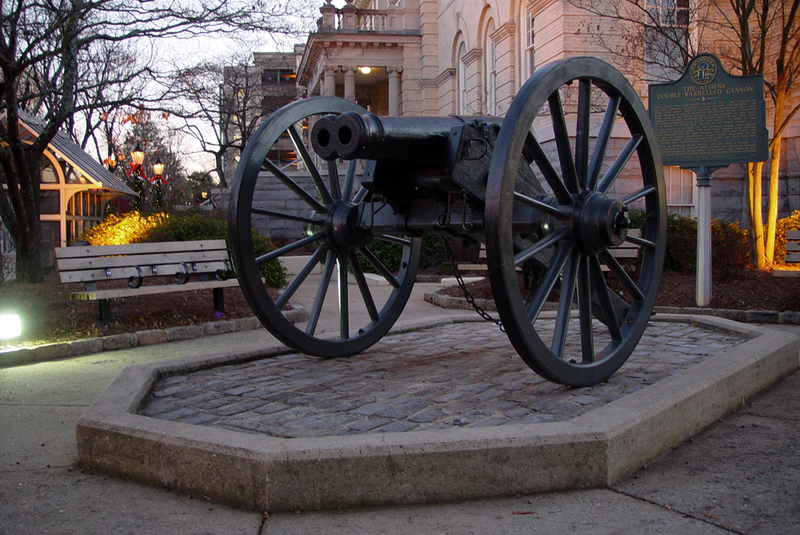 Yes, that's a double-barreled cannon. 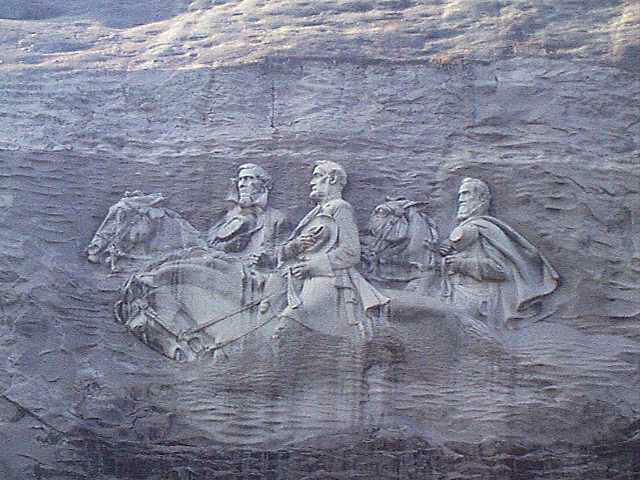 And you wonder why The South lost the war. Unquiet on the Western Front: Andrew Luck, Jimmer Fredette, and more. Big Tentacles: Terrelle Pryor, Tim Hardaway Jr., and more. 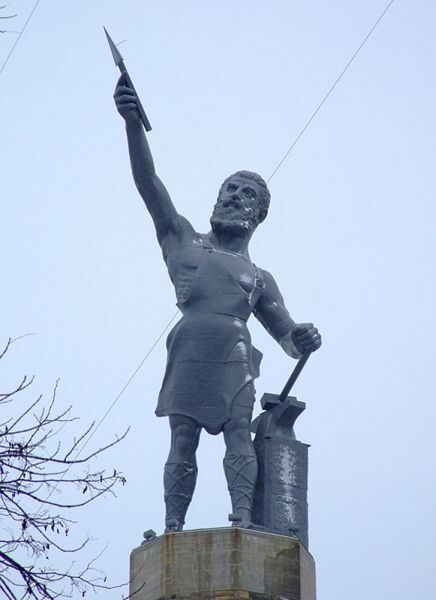 Nick Saban's graven image will finally be revealed at Alabama spring game. The statue of Nick Saban to commemorate Alabama's 2009 season BCS championship will finally be unveiled on April 16, the day of Alabama's spring practice game. Maybe it took the building of that snowman on the still-vacant site in front of Bryant-Denny Stadium to galvanize the University of Alabama to get around to erecting the much-talked about statue. Jimmer Fredette immortalized in LEGOs. This is from the "It Had to Happen" file. Someone decided to pay tribute to BYU's Jimmer Fredette with a bunch of LEGOs. It's not the best use of LEGOs to recreate sporting events ever. That would have to go to the Lego version of FIFA World Cup matches. But you have to give them the BYU fans credit for trying. The Justin Beiber-Mike Gundy Mutual Admiration Society is now in session. Expect Oklahoma State to become the most popular college football program in America among the teenage set. The number one object of their desires, Justin Beiber, has the now legendary Mike Gundy "I'm a man! I'm forty!" rant as his ringtone. Here's the visual proof. And what does "The Man" himself think about this? He's apparently reciprocated the act with his own cell phone. All i can say is that at least Beiber has enough taste not to be a Gator fan. If you start seeing a bunch of teenagers wearing Oklahoma State gear, you know why. Or if you see Ozzy Osbourne fans sporting Oklahoma gear, for that matter. Was former Georgia athletic director Damon Evans responsible for the dismissal from the Bulldog football team of Zach Mettenberger? That is the what Sports By Books reported on the blog's new Facebook fan page. The quarterback was dismissed from the team last year after he got in trouble with the law during an incident at a bar in Remberton, GA . The irony is that this came a few months before Evans himself was arrested for DUI in s highly publicized incident that cost him his job. Mettenberger is now under scholarship at LSU. Evans is out of football completely, and works for a marketing firm in Boston. Will the Jadeveon Clowney recruiting saga end not with a bang, but a whimper? The story of Jadeveon Clowney, the top prospect in America according to Rivals.com, will be reaching a boiling point on Monday when he announces his decision on what college the will be playing for this fall. 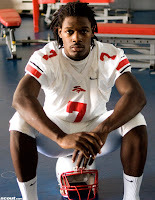 Reports are that it will be a two-school race between Clowney's home state schools of Clemson and South Carolina, with Alabama still in the running as a dark horse. This story has gone almost two weeks since National Signing Day, and might be an indication that there might be some behind-the-scenes issues with Clowney, as Saturday Down South suggests. "When a kid waits this long to announce, there has to be some red flags going off. The red flags sometimes translate to having an underwhelming effect in college, for the most part. A great example is the recent recruitment and school selection of Bryce Brown. Brown waited long after NSD to announce for Tennessee, and he ended up hating it there and left last spring for Kansas State. So far, he hasn’t lived up to the hype." There's a possibility that Clowney may have to go the JUCO route to improve his grades. If that's the case, the program that he chooses would have to wait a year for his services. Its doubtful that neither Steve Spurrier nor Dabo Sweeney want to go through the very public drama Tennessee's Derek Dooley went through with Brown. The delay in Clowney's decision could end up indicating a need to put a "buyer beware" sticker on the nation's top prospect. 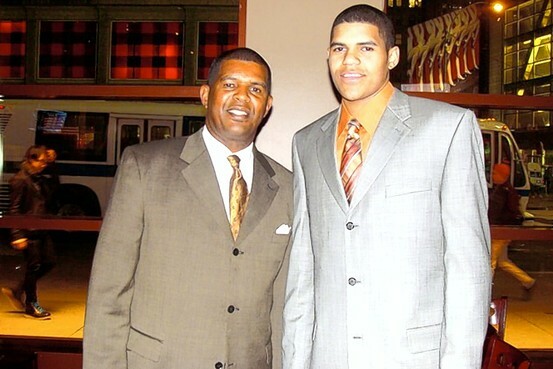 Tennessee Vol Tobias Harris' father is a tiger dad. One of the hot topics of the moment is that of the "tiger mother." the authoritarian maternal figure who is very demanding and controlling of her children. Logic would dictate that there are men out there who are "tiger fathers" and act in somewhat the same way. Tennessee forward Tobias Harris' father, Torrel Harris would probably qualify in that category. With a touch of helicoter dad to boot. "It has not happened by accident. Everything in his basketball career, from his practice habits to his college recruitment to his goal of entering the NBA Draft after two seasons at Tennessee, has been orchestrated by his father. A one-time player agent, Torrel Harris has drawn on his own experiences to write a blueprint for Tobias's future—one that, in his mind, his son will disregard at his own peril." Torrel Harris already sounds like the guy Cecil Newton wants to grow up to be like. The elder Harris' master plan for his son included forming an AAU team for his son. He also was responsible for Tobias and his younger brother switching schools on several occasions, where he had issues and arguements with Tobias' coaches. He was also very involved in picking out which college Tobias would play for. According to Tennessee head men's basketball coach, Bruce Pearl, the elder Harris felt like he'd probably want Tobias to get to the NBA even more than Tobias would want to get to the NBA." "He said he can foresee Tobias making his NBA money work for him by opening a bowling alley, a car dealership, restaurant franchises. He said he wants him to hire a pair of high-powered accounting firms—two, he said, so they have to compete for his son's business." It's kind of hard to tell if the "him" Torrel Harris is talking about is Tobias or himself in that paargraph. It wouldn't be too quite of a shock if it was the latter. Torrel Harris already sounds like the kind of guy Cecil Newton would want to be like when he grows up. It looks like America will have a new number one college men's basketball team very soon. Ohio State has suffered it's first loss of the season to Wisconsin in a 71-67 loss Saturday afternoon.It's a good enough excuse to post this legendary little goodie. 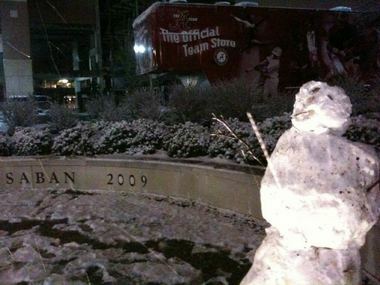 A Nick Saban snowman? A Nick Saban snowman. Cam Newton wants to be mentored by Brett Favre. A Jimmer Fredette song? A Jimmer Fredette song. Auburn fans vandalize Alabama campus...again. Tim Lincecum got a haircut? Derek Dooley doesn't do "Hot sauce" recruiting. Big Tentacles: JoePa, Michigan, Iowa, and more.